I am admittedly in the positive camp. Tom, Clarence and co always on the negative side. But outright lies designed to back up the percieved issues/problems should not be tolerated. Many read this site who may not post or attend that often. As such information they read likely to be believed. Pure lies are totally out of order. Interesting that Mr Lavender said 'don't believe *all* of the rumours," rather than "don't believe any of them." This sounds like a realistic position. As for a change to pre-season...............well they have to try something, can't keep doing the same thing over and over again and..........definition of insanity. I can't help thinking that the club needs somebody involved in the management that can really get the players going in pre-season though, because the problem seems to me to be that other teams seem to be able to bring the intensity from the first match and we seldom seem to be able to ... it's normally almost as though we are asleep for the first few sessions/even matches sometimes. "Tom. That is factual nonsense and terribly innacurate and misleading." No it's not WSM. I was in a very good position to see and looked out specifically to see how his return to form would be greeted by his team mates. They were not present on the balcony, and the chap seated next to me commented the same. Maynard was in fact sat in the dug out at ground level. It seems then that someone else at the Q & A commented on this apparent lack of team spirit, if it was denied by Maynard. Well it wasn't me who asked the question WSM because I wasn't there. It wasn't asked by the chap who was seated next to me because we walked out of the ground together, so there must have been at least a 3rd. person who had the same impression. 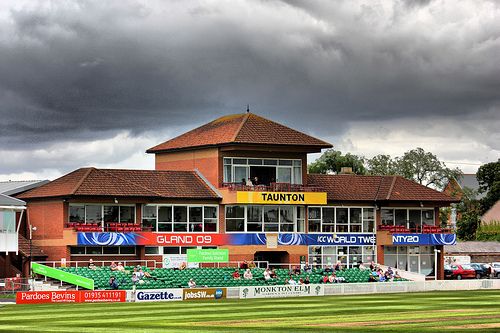 "So perhaps the rumours are in the same category as the description of the Somerset players` balcony when Tom A reached his 50." 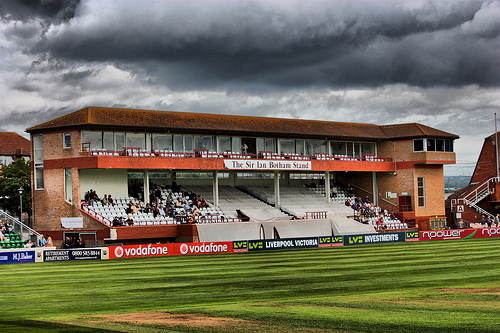 The rumours about Trego having left the club may be rumours Cricket-jerrymouse, as I intimated that they were, but don't tell me that the lack of Somerset players on the balcony to applaud Tom Abell are also rumours, because it is not only what I observed but others also. A glass half - empty or a glass half - full? Regardless, both glasses need filling up. "I raised a question on Lewis Gregory and whether he would be available for rest of T20 campaign. Maynard said Lewis playing through pain barrier and injections have worn off. Hoping he can play through pain for T20s, but would not be available to play red ball cricket again for the rest of this season as confirmed on website yesterday." And I realise that LG might want to play (and so not need to 'asked,') but I don't think he should be permitted to play either. I wasn't crazy about the idea of shooting him up with painkillers and having him play on in the CC in the first place. I applaud the guy for his efforts in having done so - especially the way he bowled at North Marine Road, but enough is, I think, enough. Well you are wrong Tom. Fact. I spoke to a player after who was up there clapping and told me all others were too. With respect i believe him more than i do you from 100 yards away. Matt was very strong in response to the question saying all were out either on balcony or in the dugouts downstairs. Toms knock was superb so to still try and find a negative slant on it is just boring. Totally false, whilst I did not count them and from my position on the Hill could not name them I had a clear view across the ground. What appeared to be the whole team were out on the balcony on their feet enthusiastically applauding their captain. Your agenda has no place on this site. Edited 1 time(s). Last edit at 07/08/2017 22:32 by wsm fan. The same goes to the person who asked the question, there is no place for people who try to make the club look bad when it isn't. I can't confirm one way or the other I was clapping the player not looking around to see who wasn't. Yes, Farmer White read your post now, we must have been at the same meeting. Decent size crowd also,150 plus maybe. Both Railboy and WSM fan have used the word "lies" in relation to a previous posting of mine. By indirectly calling me a liar they have slandered me and for this Sportnetwork is surely liable. I shall pursue this, so I ask that you both delete your posts and issue me with an apology on this messageboard. 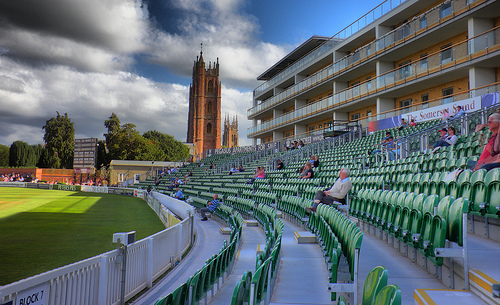 For what it is worth on the balcony issue I was in the top deck of the Somerset Pavilion and when Tom hit the runs I glanced briefly at the player's balcony. I saw three possibly four people at the back of the balcony applauding. I saw another larger group, perhaps eight or ten, just inside the dressing room looking out and applauding. I didn't look at the dugouts so can't comment on those. I then looked back at the middle, the crowd applause went on for some time and I did not look at the balcony again. How long the people there and in the dressing room applauded for or if those inside came outside after I stopped looking I cannot saay. I can say that to me MM looked genuinely surprised at the content at the question. Perhaps what different people saw depended on where they were sitting. Cricketers are, on the whole, a superstitious bunch. If they were sitting at the rear of the balcony, or just inside the doors onto the balcony, during the partnership as it was developing they would be loathe to move seats. This may explain why they weren't obvious at the front of the balcony but could be seen further back as FW describes. Tom i seem to remember u had an imaginary friend that u used to answer ur posts not that long ago. Was this the same friend today I can assure u that the players were on the balcony. Good luck with your pursuit of Tom's justice, you are nothing but a malicious trouble maker that the site master should remove. AGOD, I really think you should not interpret much into your first line of your posting of 22.16. I cannot remember myself whether the word "all or Any" was used tonight , either way may turn out to be true, or false. There will be no retraction from me Tom. Tbe players WERE out there. As confirmed by Matt, the player i spoke to who WAS up there clapping, and several on here. You mention lies. Are you not in effect accusing Matt & players of being liars? If you are thearein the morning id happily seek out Matt with you pre match and a few players and let you seek their actual response. Will you call them liars to their face as opposed to behind a keyboard? You never fail to find a negative slant even on a superb batting day in what were tough conditions. Tom It will be very disappointing for grockle to remove any posts associated with you or comments tonight as it show you in your true light for all to see. With regards to today's play, an odd decision by surrey to ask us to bat. I sense it demonstrates a lack of confidense however we can only be sure after both sides have batted. Tom was excellent and it was really good to see the players on the balcony cheering not only his 50 but the numerous 4s. They were particularly clappy at the two exquisitely timed drives of meaker in one over through wide mid off. Steve Davies also timed the ball beatifully and credit to him for I have no doubt watching that he help young Tom between overs. I can also vouch for that the support at the last match in Scarborough by our players for our players from their changing room was loud and noisy just like today. Tom do something useful log out. Well gents...... i've tried for more than 3 years to get you to use an official process to allow me to deal with things and keep it off the site. I have still to have any PM complaints to deal with because you all seem to hate bickering on the site but continue to allow it and whinge about it in public at each other leaving the moderator nothing to deal with. Only thing I can reply to officially. Is this 'libel' accusation. The person who needs to be required to act to that is the site itself. So 'Tom' if you wish to take legal action, you need to legally and officially ask SN to 'cease and desist' so they ask me to remove the posts. I'm not sure a number of posters saying the same thing while you stick by another story gives you a good case but it is not a criminal case so I'm sure the civil case will be intetesting. To talk of the cricket...followed on cricinfo ( in its new unimproved version) on my laptop while gardening and keeping an eye on the test match through the window. I~ assumed that Surrey put us in because they didn't mind us bowling 4th, which made me wonder if last year's 4th innings chase from Jack and Tim was preying on the mind. The opening partnership made me weed with increased vigour;the clatter of wickets was taken out on a batch of slugs, and I applauded like mad at Tom and Steve's 50's -although because of the distance and the fact that I was wearing gardening gloves means it may not have been noticed in Taunton. It was a day that gave much hope and I look forward to see if this can be built upon. AG. Lewis was talking about the injury yesterday. He did not talk about playing through pain (though quite a number of cricketers do). He said the injections were just not lasting long enough for anything but short form cricket. I'm sure they know enough to manage his workload in a T20 game. The class of Steve Davies really showed through today. He really is a fluent and skilled batsman. It was a joy to watch him in full flow for the first time really. Thanks to all who attended the Q & A for their reports. The content sounds relatively benign, given the extent of hyperbole over recent weeks. I'm a little surprised that no-one took MM to task specifically regarding the contents of the JA interview. We also seem to be still in the dark regarding the positions of PT, JA, MT, etc. for at least a while longer, together with the likely identity of our white ball Captain next season. I'm wondering if the questioning was a little timid, or whether MM skilfully deflected potentially difficult questions without actually responding directly to issues raised ? Tomorrow's forecast now looks particularly discouraging, I'm afraid. A little bird made a suggestion to me which makes sense viz the rumoured release of Nax Waller...namely that the club wants Dom Bess to be regularly involved in all cricket..
..And unless Roelof were to leave (a separate rumour reported by somebody else on here) there probably isn't room for 3 spinners in our white ball side (sure we could produce bunsens for white ball games in TA1 but I think too many of the punters like six fests so may diminsh the crowds if we did that. A result is very likely at Lord's. But I'm not entirely sure what I want to happen. If Warks lose, they're toast. And the track seems to have been getting easier so the odds possibly favour Middx, I would have thought. If Warks are toast they may go in the tank completely. 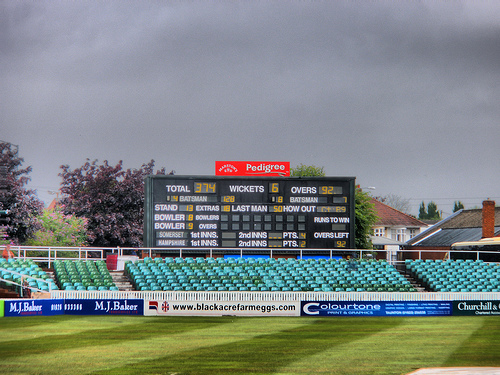 That may help us when we go up to Edgbaston? On the other hand it may also help Yorkshire, who are becoming an outside bet for relegation as Warks will also play them. If Warks were to win, they'd be not far behind us. But, if we take, say, 10 points from this current match, then we'd gain about six on Middx, cutting the gap between us to 24 points with five games to go. I thought this was a must-win game for us before it started and I still think that. But I don't think the weather will allow enough play, and I fear the pitch may prove too slow anyway for us to be able to win this one. A Middx win at Lord's would all but put them out of our reach in terms of trying to possibly finish ahead of them. Incidentally, I note that Yorkshire have still to play all of Warks, Surrey and Middx. Edited to correct nonsense as pointed out by Chunky. Thank you, Chunky. Edited 1 time(s). Last edit at 08/08/2017 07:20 by AGod. If we take ten points from this current match then we shall be 29 points behind Yorkshire, but with a game in hand, as per the current table shown on the Beeb. I note also that Surrey and Middx must also play each other (in the next round, in their case). 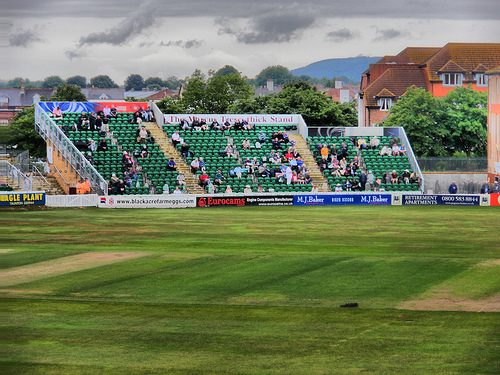 AGod- You seem to have forgotten last game of season is Somerset v Middlesex. I was hoping it would be fight for the title- not a battle to avoid relegation. If the Warks final two wickets could drag things out for ninety minutes or so this morning, then it's possible that Middx might not have time to get the runs today (although Warks might take the ten wickets). This might be relevant because tomorrow's forecast for London is so extraordinarily bad (quite a bit worse than that for Taunton which, itself, is very unpromising) that there might possibly not be a ball bowled in North London should the game last that long. Yes, I still think we really do need to win this one, but not likely to be possible, I fear. But, yes we do have your guys as well as the Brown Caps again. So if our lot could manage to win those two games and avoid disasters elsewhere then things might be very tight. If we could find 70 points from our final five games (average 14 per match - about 3 wins and one draw or possible 2 wins and 3 draws), then they'd need either 41 pts or 42 pts from their final four (depending on number of matches won) to finish ahead of us. With the way Yorkshire are currently batting they could not be that confident of that sort of haul. However, I suppose they may get Ballance back from his broken digit next month because he won't get picked for ODIs, which might help to rally their batting. Well there's the first brain blown AG. While you are reconnecting another ( I check your stores, at this rate you won't reach the next game let alone the end of the season). Have you heard of a 'computer'. Put all the possibles in there and it can give you the result. I think they call it writing an 'algorythm' on Star Trek'. Meanwhile for us bumbling along in real time. 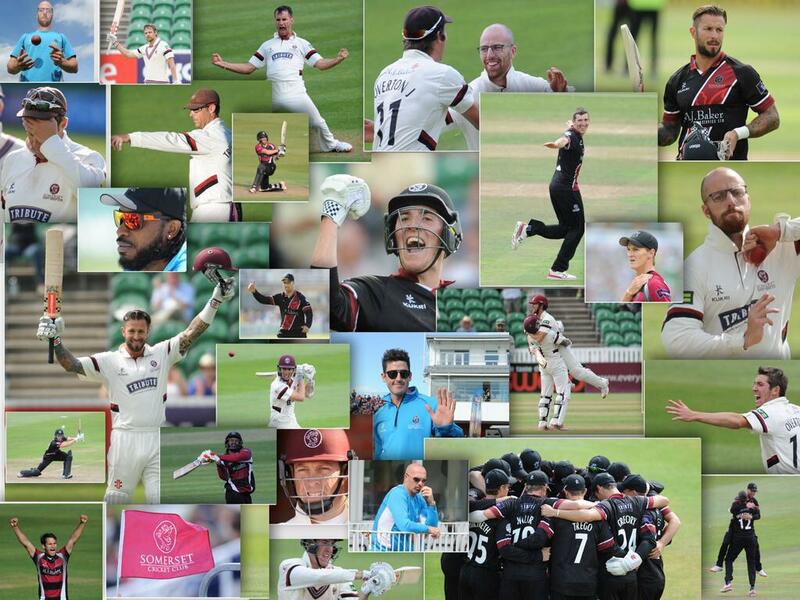 I think Max's prospects for next year are bleak at Somerset because of the presence of Dom as suggested. The conversations were certainly about getting Mr Bess more effectively involved. Although it is a shame as Max is well worth his salt in T20, that one 'dimensionalness' has always been his Achilles Heel. Apart from the runs, I am encouraged by Abell's comment that he has "gone back to basics with my technique". When I first saw him bat it struck me that he had a good orthodox technique: his left shoulder led and he got well forward or back. Seeing him this season it seemed to me that he was more square on and a gentleman who has held the highest positions in the Club sat with us on the hill for an hour during the Yorkshire match and offered the opinion that one of Abell's problems was that he was not getting far enough forward to a good length ball(I precis his remarks). Let's hope he has turned the corner.